Our Diesel Generators are all manufactured individually here in Albury Australia, they are not an off the shelf item which means you can choose the right engine/generator combination to suit your needs specifically. CJ Perry diesel generators can be powered by your choice of engine from Hino, John Deere, Kubota, Yanmar or Isuzu. 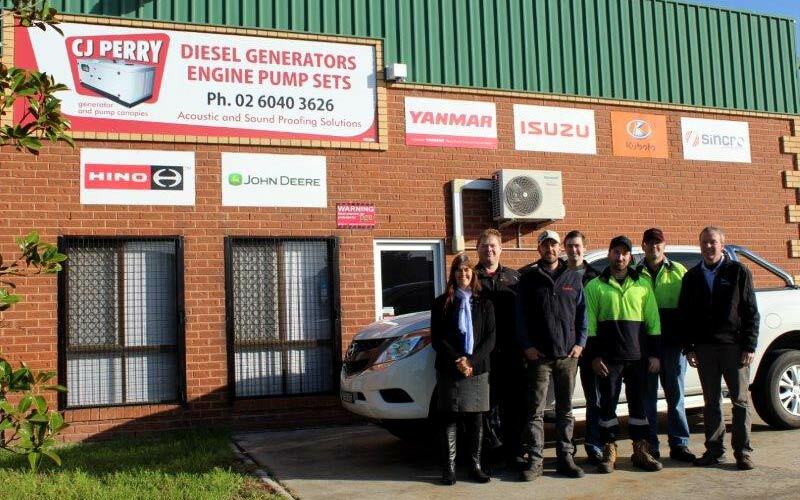 You will find CJ Perry diesel generators throughout Australia particularly in rural and remote areas. Our generators are manufactured for long life in harsh ambient conditions. Our generators may be used as Prime Power or Back-Up Generators for a variety of applications including Pivot Irrigation, Bore Pumps, Cattle Stations and Roadhouses, Portable Power, Mining or Grain Silos. CJ Perry diesel generators are manufactured to suit your specific need which enables you to have a reliable, high quality product. Our Quality Australian Manufactured Diesel Generators may be supplied directly to you or through our network of dealers. Our generators are available with an open skid frame, half canopy, a fully enclosed canopy or a lockable, silenced canopy. They are delivered Australia wide and backed by a 24 hour emergency phone contact. With over 30 years of experience with generators you are in capable hands. Please contact our sales representative to find out what options are best for your individual requirements. We have extensive experience in coming up with the right solution on acoustic performance for the Power generation as well as water pumping industries throughout the world. Sound Attenuated Enclosures suitable for a wide range of Generating Sets or Engine Drive Pump applications. We manufacture a range of premium quality diesel generators. All generators are built to order (typically 3 weeks) and can be customise to suit your requirements. We are leaders in the manufacture, supply and installation of acoustically enclosed generators and pump units throughout Australia.